Welcome to the Sbyke P20 Scooter Giveaway! This makes a great Holiday gift for a child that needs to get off the couch. The Sbyke is The next step in the evolution of scooters and you have never seen anything like it! Kids and adults alike can enjoy this scooter/skateboard/bike hybrid. 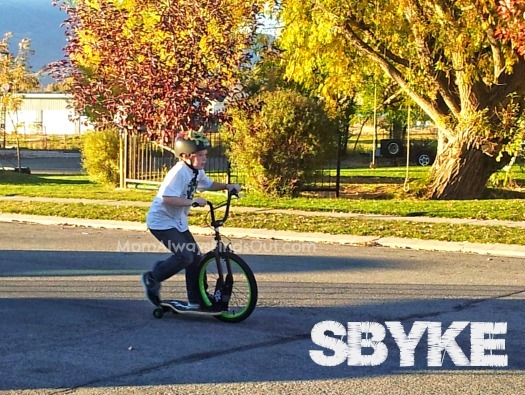 From the half pipe to the paved trails in your neighborhood - the Sbyke is a fun way for everyone to get active. Nicole at Mom Always Finds Out recently reviewed an Sbyke with her 9-year-old son, Logan. He loves to ride his bike and scooter, so the Sbyke was a match made in heaven. Logan says he knows other kids will love riding the Sbyke and that once you get the hang of it, it's easy. You can read her review and watch a home video on the review blog post. Holidays are coming up fast, and the Sbyke is sure to be one of the hot gift items of the season! Be the first in your neighborhood to bring home an Sbyke. Learn more and Shop Sbyke scooters for the entire family. Enter To Win an Sbyke P20 Scooter! One winner will receive an Sbyke P20 Scooter valued at $249.99! This giveaway is open to USA residents ages 18 and up; ends on November 11, 2013. Please use the Rafflecopter entry form below to enter to win. Be sure to share this giveaway with your friends and family. Limit one entrant per household. *See full disclaimer below.a Rafflecopter giveaway Full Disclaimer: This giveaway is open to USA residents ages 18 and up. Mom Always Finds Out and other blogs promoting the Sbyke giveaway event are not responsible for the prize fulfillment. The Sponsor, Sbyke USA, is responsible for prize fulfillment. Facebook is in no way affiliated with this website, the sponsoring company, or this giveaway. Mom Always Finds Out was provided with an Sbyke for the review and giveaway blog posts. All opinions expressed are the blog’s. The giveaway winner will be contacted via email within 48 hours of the end of the giveaway. Winners will have 48 hours to claim their prize before an alternate winner is selected. If you have any questions or concerns about this giveaway, please contact Nicole at momalwaysfindsout@gmail.com. Would you like to feature your products in a giveaway event like this? Contact Nicole for more details.